The Wyoming eviction notice forms are documents stating the landlords intention to file a forcible entry and detainer (FED), otherwise known as an eviction, due to the their lessee violating the lease agreement. The most common non-compliance issues are either the non-payment of rent or breaking a specific condition in their lease agreement. For landlords and tenants they should review the Frequently Asked Questions. If a tenant does not respond to landlord’s notice, the landlord may go to the Circuit Court representing the county in which the property is located to file a Forcible Entry and Detainer Action. 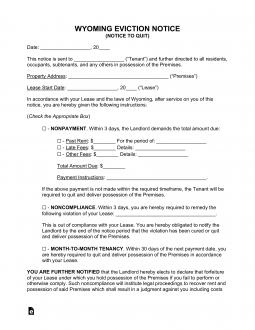 3-Day Notice to Quit (Non-Payment & Non-Compliance) – This form starts the eviction process when a tenant is failing to abide by the terms of the lease. Landlord must wait three days before filing any proceeding in court. 30-Day Notice to Quit (Month to Month Tenancy) – This form is for a party to a month-to-month tenancy know that they do not intend to renew the lease at the end of the month. Rent is late if it is not presented to the landlord on the day set forth in the lease agreement between the parties. Step 2 – The next step in the eviction process, assuming tenant hasn’t responded satisfactorily to step one, is to file a Complaint and Summons for a Writ of Restitution with the Local Circuit Court in the county in which the property is located. Step 3 – The court will issue a summons to be served on the tenant by a process server requiring them to appear in court. The tenant can file an Answer with the court. Step 4 – If the court finds in the landlord’s favor, the court will issue a Writ of Restitution and the sheriff will be authorized to move the tenant out of the premises. The property being discussed will have a written Lease Agreement (ideally) which should be made available for reference when filling out this form. You may save this form as a PDF, ODT, or Word file using the buttons below its image on the right of this page. The first line of this page must have the Full Name of each intended Recipient presented. Several facts will need to be clearly stated for the purpose of Identifying the Property and Lease this Notice applies to in relation to the Recipient. First, we will address the Property Location. This will be defined in the first statement utilizing the blank spaces it contains. You will need to enter (in this order) the Leased Property’s City, Leased Property’s County, Leased Property’s Zip Code, Leased Property’s Building Number and Street, as well as the Leased Property’s Apartment Number in their applicable spaces. The next sentence must have the Lease’s Signature Date reported. The Signature Date should be entered in the following order: Calendar Day, Month, Year. The Notice being delivered will require a definition that must be selected by the Preparer of this document. You may select the Notice type by choosing one of the boxes below and filling in the information required where appropriate. Use the first Notification statement, “Nonpayment,” to require a Tenant to Pay a past due amount in Rent or remove his or her belongings and move out. This statement requires some basic information regarding this situation. First enter the identity of an Authorized Agent the Tenant may pay if the Landlord is not available. Then report the full Sum owed by the Tenant, the Minimum Required Payment that represents an Overdue Rent, and the Time Period which renders the Tenant in delinquency status. Use the second Notification statement, “Noncompliance,” to give the Tenant Three Days to fully comply and correct Lease Terms he or she has violated or to allow the Landlord possession of the Rented Property. Describe the offense on the blank space presented. Use the third Notification statement, “Month To Month Tenancy,” that contains the term “I am your Landlord” to give the Tenant Thirty Days’ Notice (from the next Calendar Day the Rent is due) until the Date his or her Monthly Lease becomes inactive. Report the components (Day/Month/Year) of this Termination Date in the appropriate spaces of this statement. Use the fourth Notification statement, “Month To Month Tenancy,” that contains the term “I am your Tenant” to provide the Landlord at least Thirty Days’ Notice from the next Date the Rent until the cessation of the Lease. The last active Date of the Lease must be provided (this is the Date the Tenant will move). The Landlord/Agent Signature line, after the paragraph commencing with the phrase “You Are Further Notified…” must have the Signature of the issuing Landlord or Landlord Agent. If you are the Delivery Agent and have completed delivery of the Recipient copy, then find the section “Certificate of Delivery.” Use the first three spaces after the term “I certify…” to report the exact Date of Delivery. Then report the Recipient Name on the next blank space. Note: This must be the person who physically received this document or to who this paperwork was mailed to.